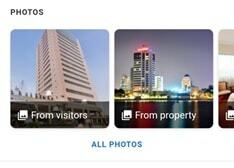 The newest hotel search features of Google are a far step ahead of any other meta-search engine out there. In this post, I will introduce the new interface and show you the 7 most important features. 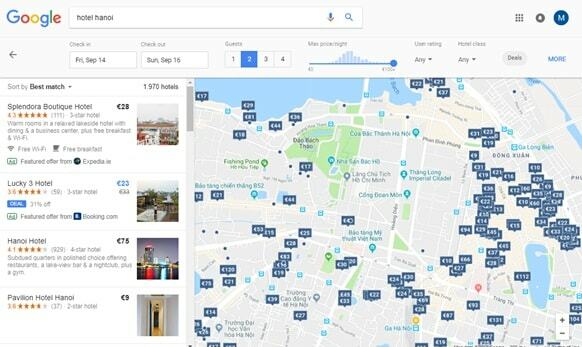 After Google’s most recent updates, searching for a hotel will result in a page with a completely new re-design of Google Maps for hotels. While Google Maps was not much more than a nice addition to the search results, it now serves as a complete new meta-search tool! Note: Google is still experimenting with this interface. This means it is still not visible to everyone. The highest chance to find this new preview is on a non-mobile device and you need to login into your Gmail. Besides the great interface and a flawless map browsing experience, there is much more to discover. The extra features make this tool really different from other meta-search engines like Trivago and Kayak. Note that two of the seven features discussed in this post are only available on mobile. This means you have to switch to your mobile device to see the latest two features discussed in this post. 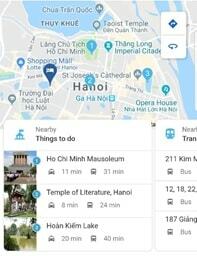 I will now show you the ones that I found most useful for a hotel search in Hanoi. Will Google change the way you search for hotels? When you don’t login into your Gmail account, you will still get the old interface. And that’s for a reason… Google uses the data from your Gmail account to personalize your results. The info mark in the right upper corner, informs you that search results might be personalized. Besides your browsing and app activity, Google also uses your travel confirmations send to your Gmail. Some people will like this, some not. That’s always open for discussion. If you are wondering which data Google is using, you can find a complete overview of your personal browse activity with the link Google provides you. Maarten’s view: Searching for the best hotels is like a sport to me. And that’s why I will keep doing my own hotel research. 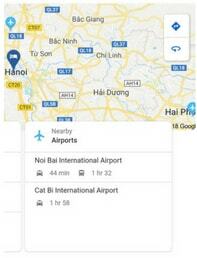 But when I want to find a hotel quickly, I am more than looking forward to receive the best advice from mastermind Google! Google Flights implemented the price-tracking option for flights already last year. From now on, you can use this tool to track hotel prices too! A big plus is that Google creates a page on which you can find an overview of all locations you are tracking. Google compares the difference between the current price and the average hotel price. Thanks to the deal icon, you can now detect in one glance if the hotel price is lower than usual. Are you one of those deal-hunters? Then you will love the filter tool that only shows you hotel deals! Not impressed yet? Check out the price insights discussed later on. These price insights show you an overview of the prices from the last 30 days! 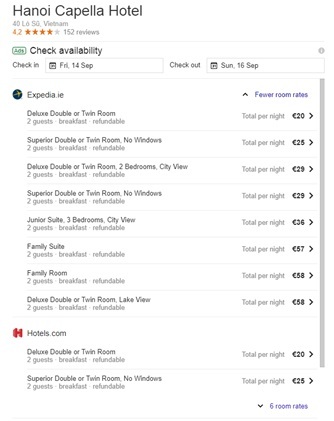 When using Google’s new hotel search engine on your mobile device, you can find special deals that are only showed to mobile users. To be sure that this is not a cheap marketing trick, I double checked the discounted hotels on my laptop. When I used my laptop, I found a higher price without the mobile discount. That means that mobile deals are truly exclusive to mobile devices! Note that I only found this special deal with Agoda. Agoda already offers these mobile deals for several years, but the integration with Google makes it even easier to make a fair comparison. Each time I found a mobile deal, this was also the cheapest price out there. Even more interesting, I found even better deals when I started my search on Google. This means that the Agoda website doesn’t always give you the best rates when you start the search on their own website! Thanks to illustrative icons, you get a quick impression of the most appreciated services. 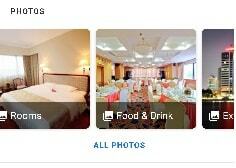 Instead of only seeing the perfect shots made by the hotel, you can also browse photos uploaded by visitors. Thanks to the categorization, you don’t have to go through countless food pictures anymore when you are only looking for pictures of the room. 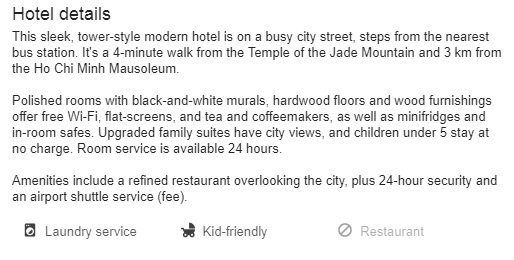 When the hotel pictures evoke enough interest, the brief description will tell you all you need to know! It’s not as extended as the descriptions on Booking.com, but I think it’s a great summary of the most important information! Still need more info? Browse through previously asked questions or just ask one yourself. Google has a large community of Local Guides who will be happy to answer your question. And if they can’t answer your question, you will likely receive a response from the hotel manager quickly. TripAdvisor used to be the number one place for reviews, but that has changed quickly. 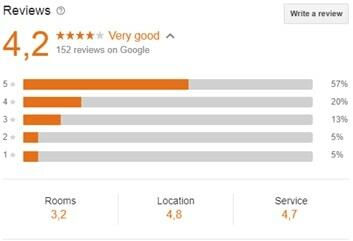 The number of reviews on Google is growing exponentially and also does Google categorize the reviews on ‘Rooms’, ‘Location’ and ‘Services’. Another benefit of Google reviews is that they are more reliable. Reviewers need to login into their Gmail account and can only place one review per visited place. This also prevents situations were business owners promote their own service to a higher ranking. A perfect example of how this can go wrong is a fake London restaurant which ranked nr 1 on TripAdvisor. 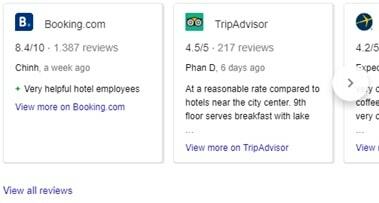 It gets even better: You can now compare ratings from Booking.com, TripAdvisor, Expedia, Agoda, Hotels.com and Google in a matter of seconds! Want to read the full description? No problem. Click on “View all reviews” and read the full descriptions from travellers on the same page. You can use the filter tool in case you don’t want to rely on Google’s algorithm that shows you the most relevant reviews. The filter tool allows you to filter the reviews on booking platform or sort them on the newest, highest or lowest ratings. This is something no other meta-search company has done before. Meta-search websites like Trivago and Kayak only show one room rate per booking website. This can make it an unfair comparison as the meta-search engines sometimes compare different room types. Seeing all room rates without having to leave the page is a very impressive feature. It allows you to do comparisons without having to visit any of the booking websites before you make your booking! 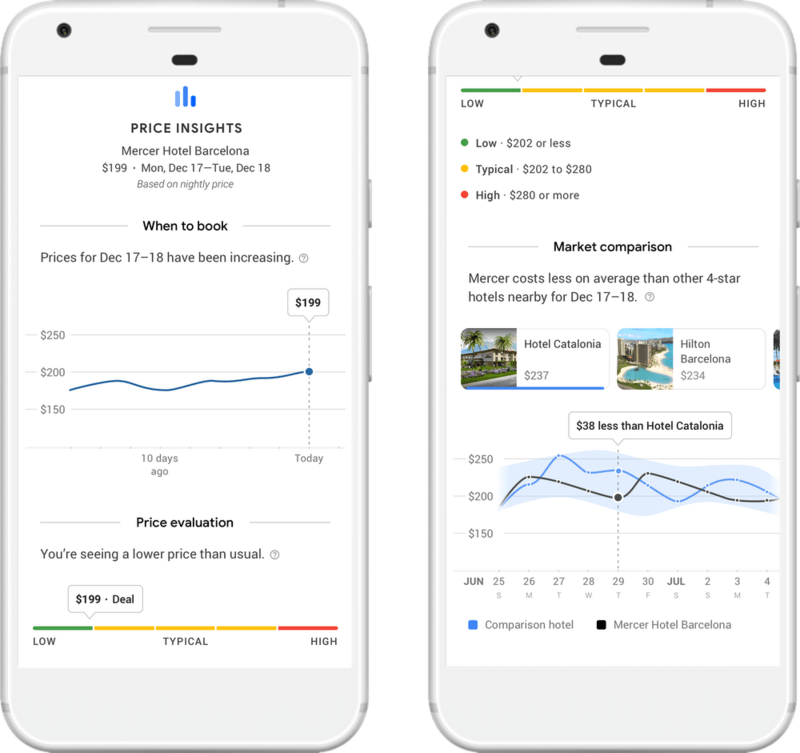 While the price-tracking option is not a game-changing feature, the new price insight definitely is! 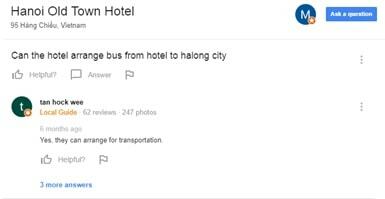 To start with, Google shows you a pop-up to compare the hotel price to similar hotels nearby. Using the link, re-directs you to a screen with an interactive graph with the price development for this hotel and similar hotels in this area. Ready to book your hotel? Use the tool to view the price history of the last 30 days and discover what is the best time to book! 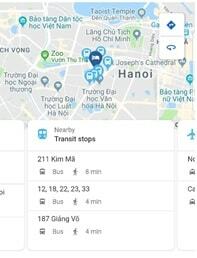 Not only does the mobile view show you the nearest bus stops and airports, but also things to do nearby. Even better, Google proposes a day plan in which order you can visit these sights. This is a feature that Google already introduced in 2016 in its mobile Trip app. But, now you can also use this feature without having to download the app! It’s not without a reason that Google is the most used search engine on the internet. Their algorithm does an excellent job of showing you the best results. And with this tool, Google proved they can do an even better job for hotel searches. 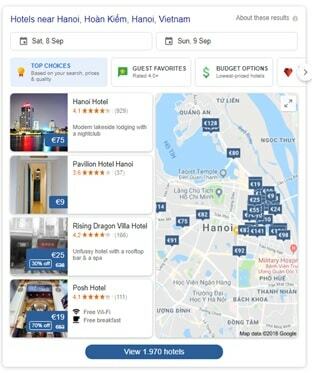 For me, this will change the way I search for hotels. 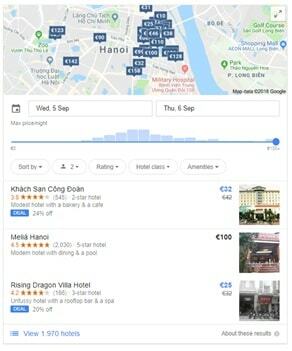 Í also don’t see any reason why I should still use Trivago, Kayak or any other meta-search engine to search for hotels. I am curious to read your opinion as well! What do you think of this new meta-search tool? Will you still keep using Trivago or TripAdvisor? Fill out the poll and leave your opinion in the comment box below!